Disclosure: I received this product for free, however all opinions expressed are my own. I am someone who has a hard time drinking enough water each day, so it’s common for me to feel dehydrated. Although I of course need to improve my water intake, I also craved some assistance in getting hydrated fast when I was working out, etc. However, I felt like drinking a hydration sports drink wasn’t an option for me, since I strive to eat all-natural, and so many hydration sports drinks are packed with high fructose corn syrup, and other unnatural ingredients. I recently discovered an all-natural hydration sports drink called BODYARMOR. It has natural sweeteners, coconut water, vitamins, low in sodium, and no artificial coloring. I tried six of the flavors, and they were all fantastic! And they were not overly sweet like many other sports drinks. If you’re someone who feels sluggish for a long while in the morning, than having a hydration sports drink can help immensely! 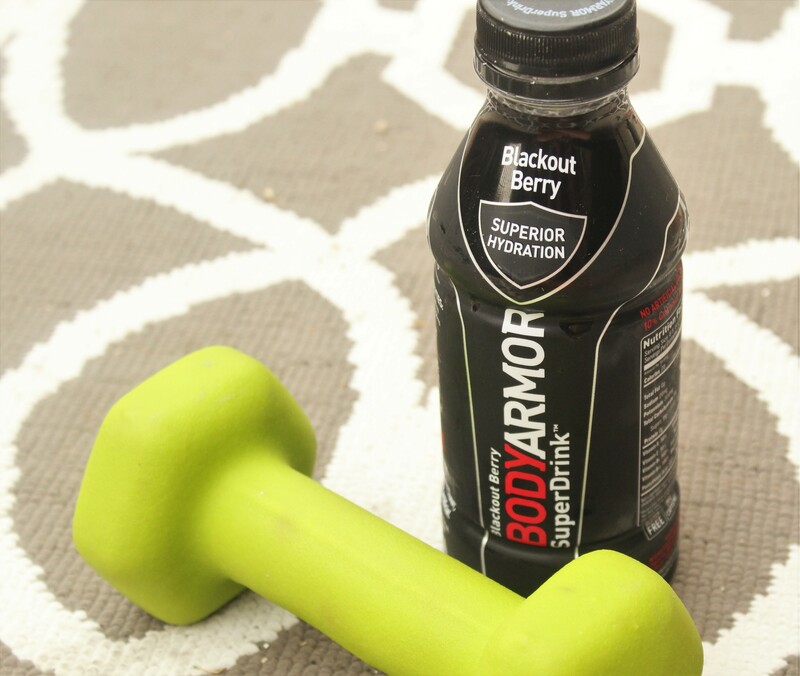 A little goes a long way with BODYARMOR to help you feel energized, so even having just half a bottle can help provide the energy you need to make your morning more efficient and help ensure you can get your morning routine done without fatigue. I love drinking water before and after a workout, but I am not a huge fan of drinking it during. To stay hydrated with how much I’m sweating I have to drink a lot of water, and then I get that feeling of water sloshing around in my belly…not fun! So I love to sip on a BODYARMOR during my workouts so that I don’t have as much liquid in my tummy while I’m moving around. It makes working out much more pleasant and hydrating! I commute to places a lot, at least three times a week. The trouble with that is, since I’ve had a kid (and am a woman) I have to pee frequently. I was never able to take advantage of all that driving time to hydrate with water since I would have to go to the bathroom so easily. Now when I know I’m in for a long drive, I take a BODYARMOR with me so I can hydrate well with less amount of liquid in my system. We all get in moods from time-to-time to have a fun, fruity drink! Often times though fruity drinks are high in calories or unhealthy. If I’m in the mood for a tropical beverage on a hot afternoon or at a party I’m hosting, I think these are a great alternative and are just as delicious (if not more so)! To make it more likely for me to get out of bed and workout, I like to make sure I’m hydrated the night before. What I don’t like is when I hydrate with a lot of water and then wake up once or twice in the middle of the night to go to the bathroom. So whether you are trying to hydrate last minute before bed because you weren’t great at staying hydrated during the day, or trying to “stock up” for the next morning if you know you’re going to be active, a hydration sports drink is the perfect answer! Prior to trying BODYARMOR, I felt dehydrated in so many situations in my life where I couldn’t drink a lot of water. I didn’t want to fill my system with sugar, high fructose corn syrup, and artificial coloring and then end up crashing a couple hours later. BODYARMOR however, doesn’t create dips or spikes in blood sugar, but helps give me a great boost of steady energy for the day, and I don’t have to sacrifice being hydrated in the above situations anymore! I am thrilled I found a hydration drink that fits my all-natural lifestyle. 6 out of the 8 flavors of BODYARMOR: Fruit Punch, Orange Mango, Mixed Berry, Blackout Berry, Tropical Punch, and Strawberry Banana. You can find BODYARMOR at numerous stores throughout the country. For my fellow Southern Californians, you can find these at Target and Ralph’s.